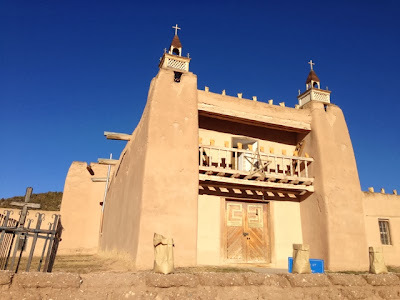 I have wanted to visit northern New Mexico for a long time, and it is even more enchanted than I had imagined. 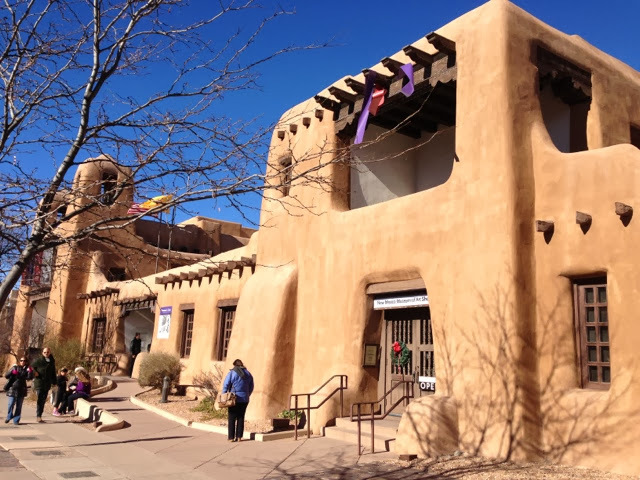 The sky sparkles a rich blue against the tan land and adobe buildings. The air is cool and crisp, just as I had hoped. And the food is that wonderful fusion of southwestern America and Mexican. 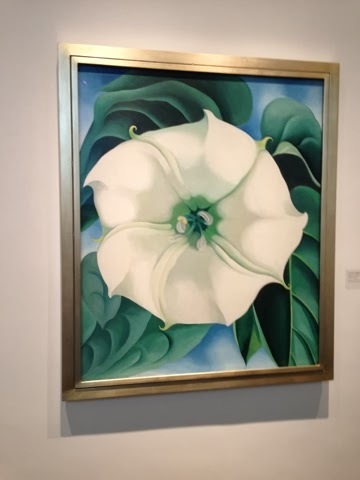 This is the part of the world where painter Georgia O'Keeffe found a spiritual home and just being here gives me a taste of why. This desolate desert landscape offers up a freedom and clarity, the emotions I feel in her works, like the one above that we saw at the Georgia O'Keeffe Museum this morning. 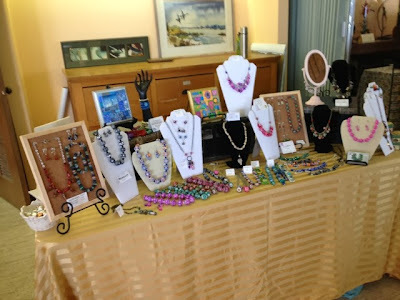 From there, we headed over to Canyon Road, one of the places art collectors go to shop. We wandered in and out of galleries, finding an unending parade of beautiful and thought-provoking works. None in our price range, but that's OK. I don't know how anyone chooses just one. Or even two. 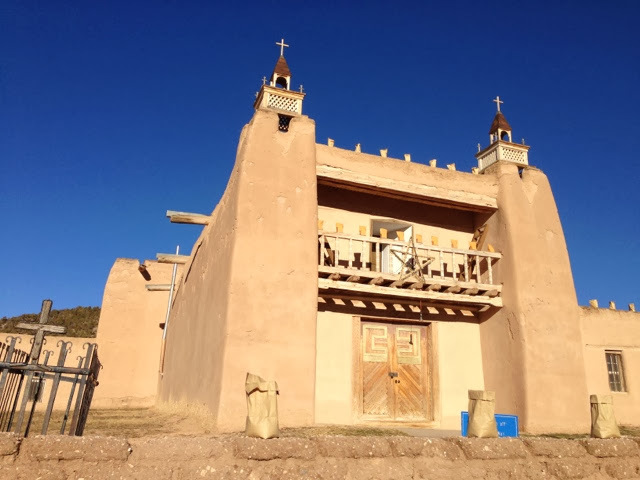 Driving the high road to Taos this afternoon, we came across this lovingly preserved church in a little town. I met my friend Marsha at La Brioche, bakery/restaurant in our part of town, for breakfast. She's a knitter, too. Luckily business was slow (I assume most people were out finishing their shopping! 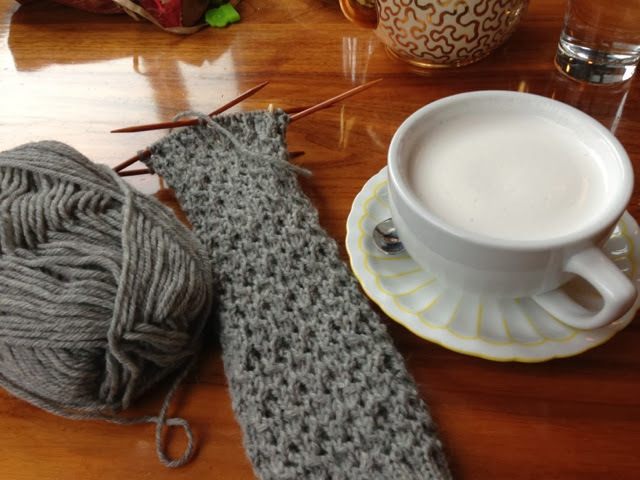 ), so we were able to linger and knit. 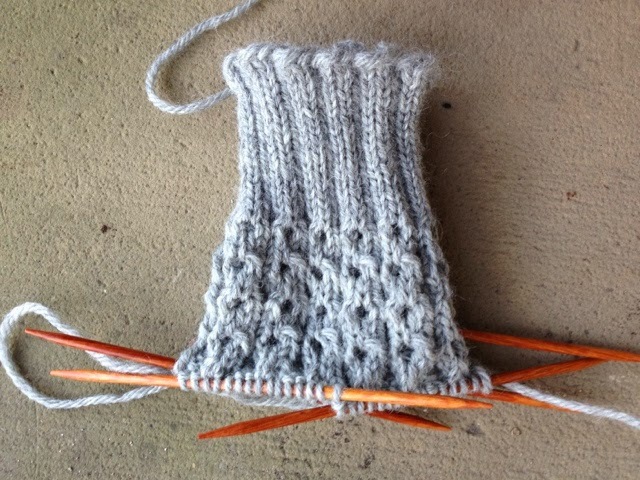 As you can see, I'm still plugging away at my Les Cables de Faux leg warmers. I was sipping a hazelnut steamer. Being Jewish in a Christian world can be a little strange. But I have to say that it was lovely yesterday to have the day off and no festivities to prepare for. I love to knit and talk with Marsha. She's the kind of person who listens well, offers support, shares insight. And she is hilarious! I hope I am half the friend that she is. Today we are having Christmas dinner with Keith's family because on Christmas itself we are flying to Albuquerque, then driving up to Santa Fe and Taos. Even though we are in the midst of binging on Breaking Bad, we are not going to take one of the Breaking Bad tours in Albuquerque. I can't wait to hit all the galleries and museums, while Keith is looking forward to skiing. May your holidays be happy! My dear, dear niece has been diagnosed with POTS -- Postural orthostatic tachycardia syndrome, which is caused by a low volume of blood returning to the heart after a person stands. The most common symptoms are ligh-theadedness or fainting. My sweet girl has also been suffering from headaches, nausea, and a sensitivity to light and sound. I wanted to share this because it took doctors almost a month to figure out what was wrong, a month in which she was unable to go to school or do much of anything. We had never heard of this, and apparently many doctors were unaware of it also! It tends to strike women between the ages of 15 and 50. Young women like my niece, who is 13, usually are symptom-free within five years. 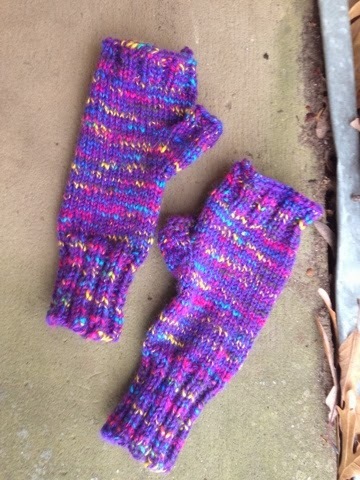 Since I haven't figured out how to send hugs to the East Coast, I knit up this pair of Peekaboo Mitts (my current obsessions) for her. The yarn is Plymouth Jelli Beenz Yarn, a 75% wool/25% acrylic blend that gets a 4/5 star rating on Ravelry. I found it to be very pleasant to knit with. It's machine-washable, which I decided was uber-important to this busy family. One of the symptoms of POTS is cold hands, so I hope my niece finds warmth and comfort in these mitts. I also hope the line at the post office isn't too long! 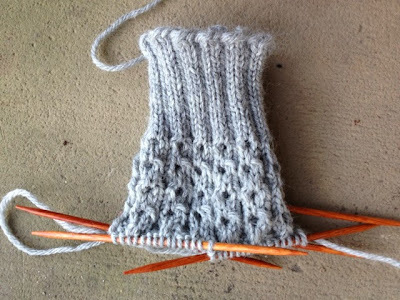 It's the first of the Les Cables de Faux leg warmers. It's a free pattern, very easy, great TV knitting. I picked out the yarn by wandering through my LYS. This gray heather colorway called out my name. It's Galway Worsted in gray heather. It's fairly scratchy, but I'll be wearing it over tights, so I don't think that will be a problem. There was a similar color in Cascade 220. The Galway won out because a) it was $1 cheaper per skein; and b) it did not need to be swifted before knitting. I have a great swift (this LYS doesn't offer swifting), but swifting does take time and effort. We are starting a couple new programs at my school, and I am working killer hours. So at this point, not swifting is a huge advantage. However, I will find a few moments to check out the other WIPs on Tami Amis' WIP Wednesday post! I love this mini-mitten. I especially like the glowing orange-yellow color. It's made from one of my favorite yarns: Cascade Quatro. I was looking at the Cascade wall at my LYS a few days ago and noticed there were only a few skeins of Quatro. A staffer happened by and said, "It's discontinued, you know." Every now and then, my old news reporter instincts kick in. I just have to know what's going on with Quatro! 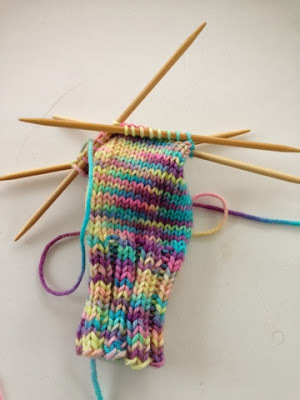 I found a brief and uninformative exchange on Ravelry here. The Webs site says it is discontinued, but the Cascade site doesn't have any information at all. The best I can surmise is that the lovely, two-toned Quatro has been discontinued. However, there is a superwash version (who knew?) that seems to be available. Still I love the original and I am crestfallen that I missed any discontinued sales. 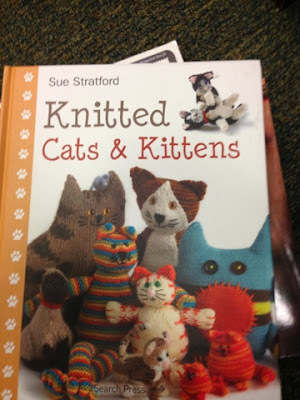 This is the kind of thing that makes me want to buy up half the stock at my LYS. You never know when a great yarn is going to be discontinued! Anyone remember Sheep Shop Yarn? 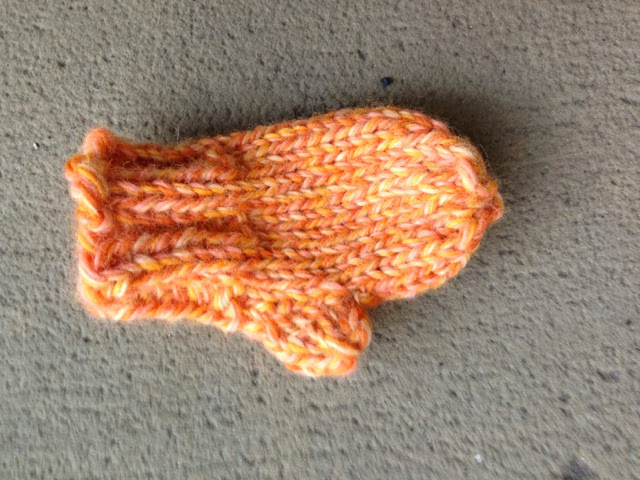 And why am I knitting a mini-mitten? That, my friends, is another post! However, they also won't purr! 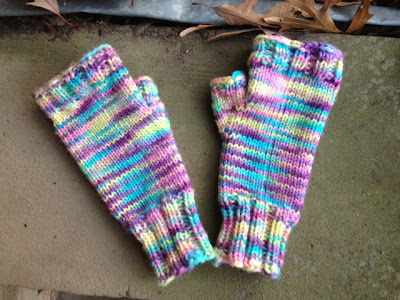 These are my second pair of Peekaboo Mitts, knit from the amazingly soft worsted produced by Three Irish Girls, right here in Wisconsin. I have to apologize for the fuzziness of the second picture -- but, hey, when it is 16 degrees outside, you snap those photos pretty darn fast. 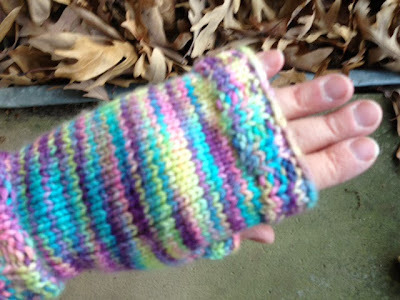 I wanted to include this photo to show you how luxuriously long these mitts are. They are so, so cozy. I just love them! I actually like this weather, as long as the wind is mild. It is just so nice to curl up with a good book -- or some knitting -- when the air is so sharp. However, I've been trying to resist both of those activities for the most part because my house needs a good cleaning and de-cluttering. I usually do these in the summer, when I'm off school, but my broken leg interfered with last summer's cleaning. So I'm trying to make up for that now. It's been a tough fall, so I indulged myself and bought a skein of Springvale Worsted from Three Irish Girls. These indie dyers are based in Superior, Wis., so I can feel good about buying local -- even though Superior is about a 7-hour drive from Madison! The colors are luscious and the yarn is buttery soft. It's quite a nice little luxury in the middle of this busy season. Ok, that may be an exaggeration. But I made more than $300 at the Local Products art show on Sunday. I realize this is small change, but it is a record for me. This is a fairly small show, but this little success makes me want to shoot higher. It's pretty amateurish, I know. Designing a low-cost display is harder than you might think. I know that I need to go to some other shows/fairs and really pay attention to the displays. It's just so easy to get distracted by what they are selling! Doing a show on Sunday was exhausting after the Thanksgivakkah weekend, but it was worth it!